The extreme weather of 2012 and recent news that climate change is worse than previously thought have made it a front-page issue again. The Obama campaign’s silence on the issue and worldwide government paralysis have added to activists’ frustration and fueled participation in 350.org’s historic February 17th demonstration and campus fossil fuel divestment campaigns. This has also opened the door to a more radical analysis of global warming and environmental destruction. For a radicalizing and substantial fringe of people touched by the ideas of Occupy, an ongoing economic crisis and growing ecological crisis, they recognize that it’s not enough to limit your analysis to only fossil fuel corporations (though that’s a good start) or absolve politicians based on the lobbying power of those particular companies. And if that’s the case, then we need far bigger goals than just limiting their investment opportunities with college endowments (though again, it’s a good place to start). Ecosocialists must quickly offer a more holistic explanation that centers round the operation of capitalism and therefore helps to explain why Obama isn’t our ally and why we need an entirely different society. 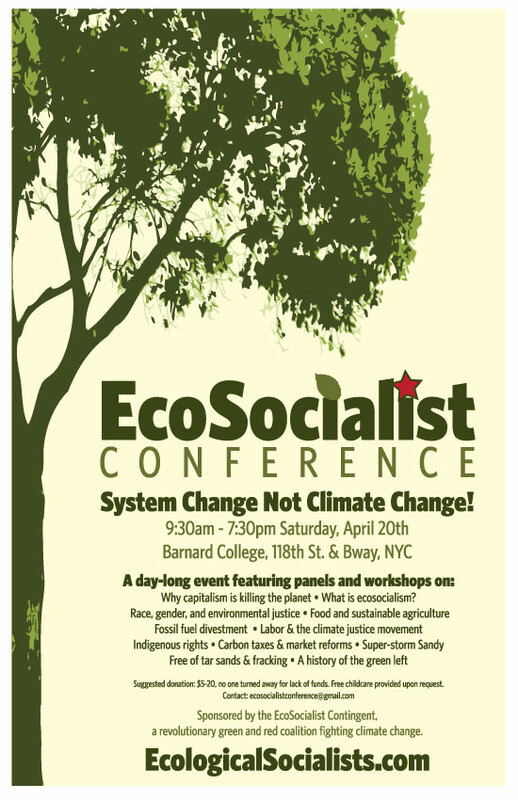 To that end, the Ecosocialist Contingent is hosting the Ecosocialist Conference on Saturday, April 20, 2013 in New York City. We are looking for groups who agree with the Ecosocialist Statement to endorse, build and participate. The conference, like the February 17th action, represents a move to a more collaborationist left. We hope this conference and this network of left groups and publications grow into something visible enough to attract thousands of new activists towards socialism and powerful enough to push the climate justice movement toward revolutionary conclusions. For more information on the Ecosocialist Contingent, check out their website here. REGISTER FOR THE CONFERENCE ONLINE! 1) Agriculture and food: sustainable or profitable? 2) Carbon Taxes and Market Approaches: Can Capitalism Be Sustainable?